The Grand Bazaar in Istanbul (Kapali Carsi in Turkish) is a historic market built in 1460. 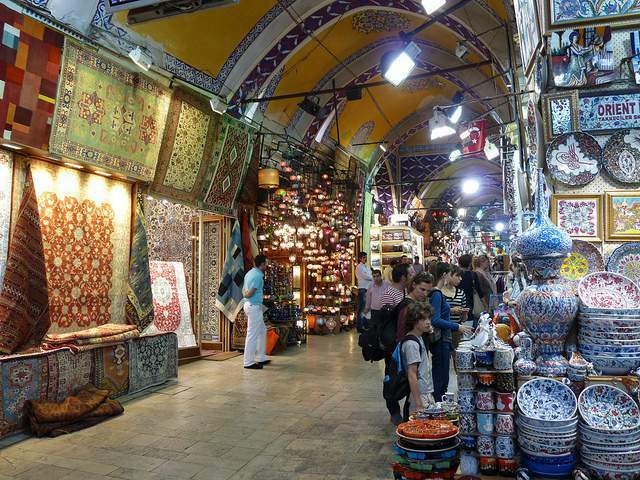 Grand Bazaar shopping is still among top things to do in the city. It started off with two warehouses with textiles and developed to one of the largest (now the oldest too) covered markets in the world. Take a T1 tram (blue line) to Beyazit-Kapalicarsi stop (Grand Bazaar Istanbul metro station). It is 15 minutes away by foot from the Hagia Sophia and Blue Mosque area. Hours: Open Monday - Saturday 9:00 - 19:00. Closed Sunday and state holidays. The bazaar has 5 000 different shops placed on 60 streets (map). There are fashionable leather products, antiques, jewelry, carpets and much much more. The bazaar covers the area of 31 000 square meters (333 681 square feet). Enough to place 24 Olympic size pools. The Grand Bazaar in Istanbul was ranked number 1 among world’s most visited tourist attractions in 2014. Sultan Mehmet II conquers Constantinople (now Istanbul) in 1453. A 21-year-old Ottoman Sultan is quick to start restoring the city after destructive war. He orders to build the Grand Bazaar in 1455 to lift the economy of the new Ottoman Empire. Istanbul is located in a favourable place - on both sides of Bosphorus Strait therefore connecting the Black Sea with the Aegean Sea. The city becomes an important trade point between East and West. Istanbul benefits from privileges of the Silk Roads. In 1461 when the construction ended the Grand Bazaar becomes the new place for commerce and exchange between the Western Europe and the East. The construction of the Grand Bazaar started in 1455. Wood was used for the building material. The bazaar will be rebuilt several times throughout the history due to fires and earthquakes. Only in 1700 the Bazaar finally gets rebuilt of stone. In the same year it becomes covered. The Grand Bazaar in Istanbul was built in the city’s marketplace area. Textiles was the only product merchants first sold here. The bazaar consisted of separate warehouses connected to each other. With time the bazaar’s territory was equipped with 4 fountains, 10 wells and 2 mosques. A dome was added to the territory later to bring wholesomeness. There were 18 gates which are still in use. Only 4 of the are considered main entrances today. To prevent the bazaar from fires only natural lighting was used. Look for many rectangular windows on the sides of the roof. A new restoration project forees improving the lighting system. Colors matter the most in the map above. The coding is rather logical. Streets selling gold are marked with yellow, for example. Silver shops are marked with grey. 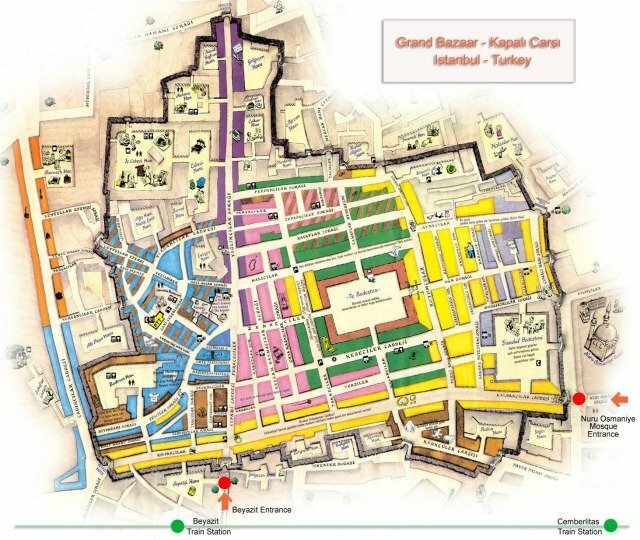 For a more detailed view of the bazaar's streets look at this map of the Grand Bazaar in Istanbul. You can also see where the 21 gates - entrances - to the market are located. If you walk in from the Beyazit-Kapalicarsi tram stop you will be at Grand Bazaar Gate 1 (Nuruosmaniye Kapisi). Gate 2 (Kurkculer Kapisi) is nearby. Find a number of shops selling fur as you enter through Gate 2. Time permits just wonder around this historic market and be surprised with what you discover. You are most likely to be handed a paper map at the bazaar if you walk in a shop. Display with silver jewelry. Photo by shankar s.
The Grand Bazaar does have its order even though it may seem like a chaos when you first enter. The sellers are grouped by types of goods they are selling. 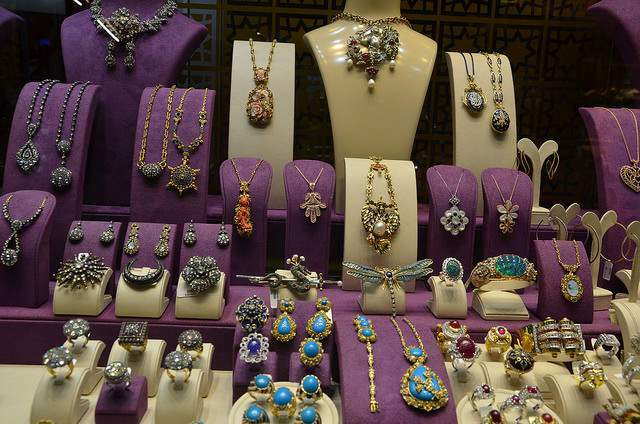 Here is where to find Turkish jewelry among the 61 streets and 5 000 shops of the Grand Bazaar. Jewelers are on Kalpakcilar Caddesi (street). Gold, silver and precious stones are also sold in Kuyumcular Carsisi (the Jeweller’s Market). Both the Kuyumcular Carsisi and Kalpakcilar Caddesi are on the east side of the Grand Bazaar. Turkish jewelry is among the most desired items among travelers. Locals also shop here for their precious decorations. If the price is too good to be true, the item might be fake. Inspect the color carefully. Discoloration might mean that your item is only gold-plated. Place a strong magnet near the item. Real gold would NOT stick to a magnet. Rub it hardly a few times on a cloth. Real gold will NOT leave marks. Bite moderately. Gold is a soft metal. Your teeth’s indents should show on the item. Ask for a certificate of guarantee. You can find almost anything the Grand Bazaar in Istanbul. Some shops sell only wholesale. They usually say so at the entrance. Others offer wholesale prices for retailer customers. Remember to always bargain!